We love sharing what goes on in our class! Check out our Seesaw Journals. Have you ever asked "What did you do in school today?" and gotten the response "Nothing..." from your child? Here's the answer to that all too common problem: Seesaw! Seesaw let's students post to a secure online journal that lets parents instantly see everything their child posts. Parents can comment on the item, and more importantly, they can know what their child did in school and can talk with them about it! 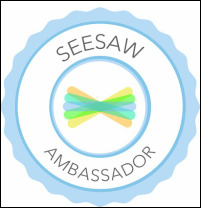 I am fortunate enough to be an Ambassador for Seesaw, so please ask me if you have any questions related to this app. We will be using it weekly, and students love when you can talk to them about their work!